We understand there is a lot of information to gather when starting college. At times, it can be overwhelming. Don’t worry! We are here to help. On this page you can find some frequently asked questions we get from parents and students. Of course, if you can’t find an answer to your question here, you can always email parents@otc.edu. Does OTC have on-campus housing/dorms? OTC is considered a commuter campus. OTC does not offer student housing on or off campus. We do, however, want to offer you valuable information and resources to address your housing needs. You can find more information about housing here. Do you have athletics or intramural sports? Since OTC is considered a commuter campus, we do not have athletics or intramural sports on campus. Can I access or ask about my student's account? Due to FERPA regulations, you cannot access a student’s records unless they give you expressed permission. You can find more information about releasing student information here. How do you set up a visit/tour of campus? Tours are offered at all of our campus locations. Guided by student ambassadors, you will go on a general tour of campus and visit programs of interest. You can even meet with an admissions representative or advisor after a tour. 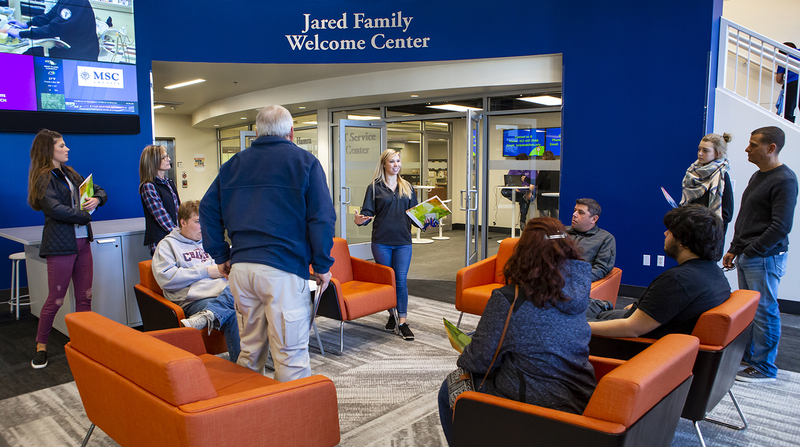 Prospective students, family, and friends can set up tours here. When should a student start the admissions process? Generally, we encourage students to start the admissions process six months prior to the semester they would like to enroll. We recommend starting the admissions process for the summer and fall semesters in the spring. Registration for both semesters start at the same time, in mid-April. Students should start the admissions process for the spring semester in the fall. Registration for spring starts mid-November. First-time freshman students can be registered for classes and have everything ready to go before they graduate high school. When should a student start the financial aid process? FAFSAs for the upcoming school year become available October 1. We recommend completing it as soon as possible so that you and your student have an idea of what aid they will be eligible for. Students (and parents if the student is under 24) are first required to create an FSA ID. The FSA ID is how the government can confirm who you are. The student will create an account for themselves and a parent will create one as well. Think of it like creating an Amazon or Facebook account. This can be done at any time. If a parent already has an FSA ID from a previous student, then there is no need to create a new one. The next step is to complete the FAFSA, which can be filled out October 1 for the upcoming year using the prior prior years taxes. For instance, if a student is starting in the 2018-19 school year, they (and their parents) will use their 2016 tax return to complete the FAFSA. Filing the FAFSA as early as possible in October, will help your child with budgeting for the upcoming school year. You can find more information about the FAFSA and other financial aid FAQs here. How does a student receive the A+ scholarship? What does A+ cover? You can find more information about A+ here. How does a student apply for scholarships? OTC offers Institutional and Foundation scholarships. Institutional scholarships are provided by OTC. The OTC Foundation scholarships are privately funded. Anyone, including current and prospective students, can apply. All students need to do is have a completed FAFSA on file, have their transcripts sent in, and complete the applications, which include an essay. You can find more information on scholarships and apply for them here. Do students need to have any certain ACT or placement test scores? OTC does not require any specific ACT, SAT, or other placement scores to be accepted or take college level courses. Instead, OTC uses a guided self-placement model. Guided self-placement is an alternative to timed placement tests like the ACT; it may be a more effective mechanism for placement in English, math and reading courses that are applicable to your experiences, interests and goals. Before registering in classes, students should view our guided self-placement resources. It is a student’s responsibility to decide which English, math and reading courses are the best fit. It is important students make an informed and wise choice about your placement. You can find more information about Guided Self-Placement here. Does OTC require a parking pass? OTC does not require a parking pass. While there is more than enough parking spots on campus, we recommend arriving 15 mins before class to find a spot and get to class. We recommend that students register their vehicle so that if there are any issues, Safety and Security can contact them. Students can register their vehicles through MyOTC. What resources are available for students? Whether students are seeking homework help, personal support or job opportunities, OTC has several excellent resources available to help students meet their goals. Resources vary by campus. You can find more information about those resources here. How does a student confirm enrollment for insurance and other purposes? Students can request enrollment or degree verification several ways: online through MyOTC, National Student Clearing House or through the Verification and/or Request to Release Information form. You can find more information about requesting verification here. How does a student know of emergencies, campus closings and other important alerts? OTC uses a Campus Alert text messaging system. To register for the Campus Alert Text Messaging System, sign into MyOTC, click on the helpful resources tab on the side menu, click on OTC Emergency Notification, and add a new phone number. For questions or concerns about public safety or public information communication, please contact the Public Information Office at 417-447-2659.